Live Racing Programs, Entries, Results, Stakes, Changes, Track Conditions, Gates Open, First Post. Horsemen Leader Standings, Condition Books, Claims Report, Stall Application, Incompass Financial, Stakes Schedule, Workouts, Workout Cam. Handicapping Jeff Siegel’s Prime Picks, DRF Selections, XBTV Videos, Seminars, Simulcast Schedule, Free Pros Picks. Interactive Home to our contests, ShowVivor, Trakus, Mobile Site, Xpressbet, and Wagering 101. Plan Your Visit Santa Anita offers many seating, dining and private options to attend the races. 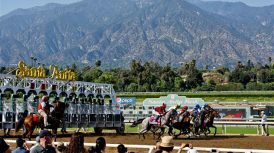 Events & Tickets Online Tickets and Information for all packages, promotions and events at Santa Anita Park. Full Calendar Live Racing Dates, Stakes Dates, Events Dates, Simulcast Dates. 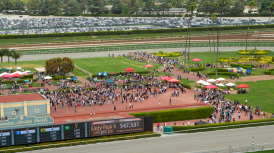 Plan Your Event Host your group or event at Santa Anita. Our facility can host virtually any size event. 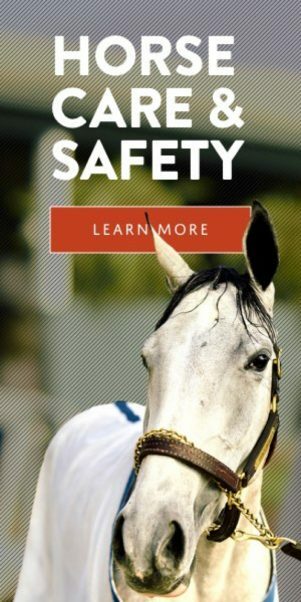 Press Releases The latest news from Santa Anita Park. 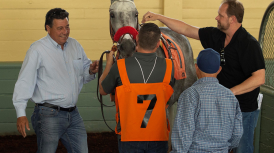 Stable Notes An insiders view of horse racing at Santa Anita Park, written by Ed Golden. Stakes Quotes Quotes from the Jockeys, Trainers, and Owners of the Stakes at Santa Anita Park. Nightly Recaps A recap of the day’s races including a summary of results, attendance, payouts and more. Rye, one of trainer Bill Morey’s major bread winners among his large stable that spans north to south, is set to defend his title in this Saturday’s $200,000 Unusual Heat Turf Classic presented by City National Bank. A son of English Channel out of the Unusual Heat mare Phi Beta Heat, Rye remains a full horse at age six. He won the Classic by a head last year under Kent Desormeaux, who will be aboard again for the nine furlong grass test on Saturday. Rye worked five furlongs Sunday in 1:01.80. “We gave him some time off (from May 20 to Jan. 10) and I was only able to get one prep race in him up north, but we’re going to give it our best,” Morey said. That’s usually the case with Rye, who has eight wins from 20 career starts, with no seconds and five thirds, earning $326,118. Not bad for a horse claimed for $20,000 in February of 2016 at Golden Gate Fields. Morey, who has 60 head in training, 30 at Santa Anita and 30 in the Bay Area, makes his presence felt in both locales. He has four wins, four seconds and five thirds from 23 starts through 16 days at Santa Anita’s Winter Meet. He also plans to enter Our Silver Oak in Saturday’s $100,000 California Cup Turf Sprint Stakes for three-year-olds at about 6 ½ furlongs on turf. Drayden Van Dyke rides Our Silver Oak, while Rafael Bejarano will be on Takeo Squared for Doug O’Neill and Edgar Payeras aboard Teacher’s Treasure for Eddie Truman in the race. The Turf Sprint is one of four stakes that day showcasing California-breds, the others being the aforementioned Turf Classic, plus the $150,000 Sunshine Millions Filly & Mare Turf Sprint and the $150,000 California Cup Sprint Stakes. All four events are expected to draw well at the entry box, with the Classic likely to attract Accountability (Joe Talamo), Ashleyluvssugar (Tyler Baze), Camino Del Pariso (Ricardo Gonzalez), He Will (Geovanni Franco), King Abner (Drayden Van Dyke), Marckie’s Water (Mario Gutierrez) and The Street Fighter (Tiago Pereira), in addition to Rye. Roy H is the sprinter that keeps on giving. 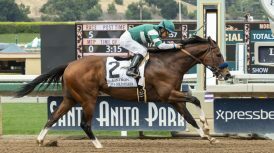 The two-time Breeders’ Cup Sprint champion enhanced his gaudy resume Saturday with a four-length romp in the Grade II Palos Verdes Stakes, winning it for the second straight year, this time in a glittering six furlong time of 1:08.89, earning a 109 Beyer Figure. “The track’s been playing (slow) and he was just cruising,” said trainer Peter Miller, who is expected to collect Roy H’s second consecutive Eclipse Award as the nation’s top sprinter this Thursday at Gulfstream Park. Roy H now has a 10-5-2 mark from 23 starts with earnings of $3,139,765. Heriberto Figueroa is one of the best-kept secrets on the Southern California circuit so far, but that’s likely to change soon. Winning races in bunches for assorted trainers will do that. “He’s learning every day; that’s what we’re concentrating on,” said his agent, Nelson Arroyo. “He’s getting better every day and he has all the natural talent in the world. Now he’s putting it all together. Figueroa, like Arroyo a native of Puerto Rico, is a 19-year-old graduate of the Island Nation’s famed Escuela Vocacional Hipica riding school, which has produced the dynamic Ortiz brothers, Jose and Irad Jr., Evin Roman, John Velazquez and Manuel Franco, among others. Arroyo expects another promising young rider from Puerto Rico to be under his wing at Santa Anitua shortly. The rider is 19-year-old Jorge Velez, who tacks about 108 pounds. 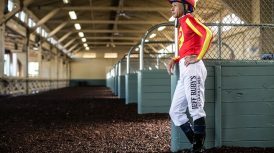 “He attended the jockey school for one year, but instead of staying there, he went to Cordero in New York for five months, but when he was about to get his license there, he fell from a horse and broke his collar bone and was out for five months. While there, he worked for Gary Contessa and Mark Hennig. 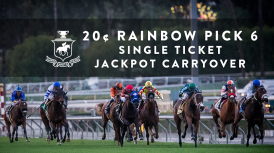 For the second consecutive day, Santa Anita Park will guarantee $2 million in today’s 20 cent Single Ticket Rainbow Pick Six Jackpot, as there was no single ticket winner on Saturday. With a $2 million guaranteed Jackpot and a live money Rainbow Six Jackpot carryover of $918,801 stoking the pari-mutuel fires, there was $442,962 in “new” money wagered Saturday, creating a total Rainbow Six pool $1,361,763. With no singleton, there is a live money carryover into Sunday of $1,020,209. First post time for a pair of 10-race cards Sunday and Monday is 12 noon. Approximate post time for Sunday’s fifth race, leg one in the Rainbow Six, is at 2:03 p.m. PT. For additional racing information and specifics on Santa Anita’s 20 cent Single Ticket Rainbow Pick Six, please visit santaanita.com or call (626) 574-RACE. 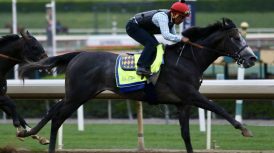 FINISH LINES: Undefeated Breeders’ Cup Juvenile winner and soon-to-be Eclipse Award champion as outstanding two-year-old male of 2018 Game Winner worked four furlongs for Bob Baffert Sunday morning in 48.60. 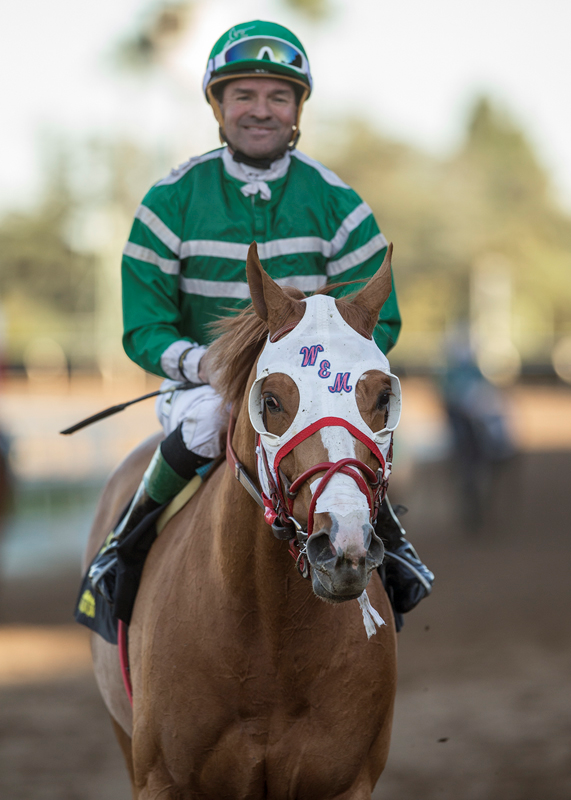 The son of Candy Ride is ticketed for the Grade II San Felipe Stakes on March 9. Santa Anita clockers had a busy morning as there were more workers than blond anchors on Fox, with 312 recorded drills, including 51 on the dirt training track, and one on the turf, that by Richard Baltas-trained Next Shares who goes in the $7 million Pegasus Turf Cup Invitational at Gulfstream Park Saturday. Next Shares went four furlongs on a firm course in 49.20 . . . Leading rider in wins and money won this meet (19 and $1,232,346) Flavien Prat will be absent Friday and Saturday, traveling to Florida the first day and riding Audible the second in the $9 million Pegasus World Cup for Todd Pletcher . . . Congratulations to Anna Meah on her first training win yesterday, sending out favored Stringent under Rafael Bejarano to capture the fourth race by a half-length. “It felt great,” Meah said . . . Today’s fifth race features six first-time starters among the field of seven three-year-old maiden fillies, two (Blue Moonrise and Jon White‘s 4-5 morning line favorite Flor de La Mar, both trained byBaffert) fetching $500,000 each at the Fasig-Tipton sales. Overall, the seven cost $2,260,000, an average of just over $322,857 each . . . Tomorrow, Martin Luther King Jr. Day, will be Dollar Day at Santa Anita, with beer and soda on sale for a buck and hot dogs for $2. First post time will be 12 noon. Copyright © 2014. Santa Anita Park. All rights reserved.